What's in mascara and how does it work? Here's the science-y scoop. First, a quick bit of background. we know that mascaras have been around since at least 4000 BC because historical records show that Egyptians used charcoal and other minerals to darken their lashes and eyelids. In modern times, mascara first appeared in the form of a pressed cake that was applied by wetting a brush, rubbing it on the cake and then applying it to eyelashes. The cake consisted of a mixture of black pigments and soap chips. The next innovation in mascara involved a lotion-like version of the soap cake that was packaged in a tube and squeezed onto a small brush to apply. Mascara as we know it today was created in the 1960s with the invention of a grooved brush that could apply a consistent amount of the pigment. This is the basic form that's still used today. The beexwax, ozokerite, stearic acid and shellac provide the main body of the mascara and give it it's waterproof and smudgeproof properties. 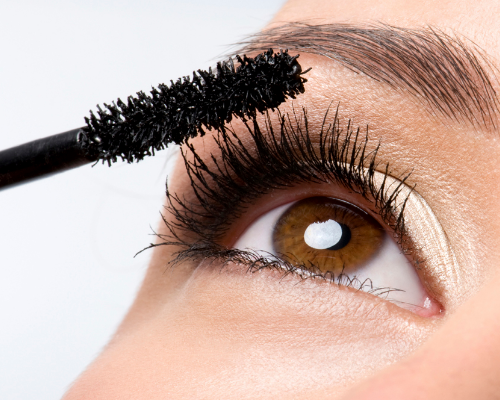 Glyceryl stearate and triethanolamine are added to make sure the mascara can be washed off. The propylene glycol, sorbitan sesquioleate and simethicone, added as processing agents, help control the consistency of the product while methylparaben, quaternium-15, quaternium-22 and butylparaben are preservatives that keep the mascara free of "bugs". Finally, the iron oxides, titanium dioxide and ultramarine blue are the pigments. This is really the simple part – when you stick the brush into the mascara tube and pull it out, a metering ring built into the orifice scrapes off the excess mascara so the brush has a controlled amount on it. When you brush your eyelashes, just the right amount gets delivered to each tiny hair fiber. The waxy nature of the mascara helps form a relatively thick coating that, due to the high wax concentration, is essentially waterproof. That's how a good mascara can resist smudging and bleeding. The result – your eyelashes get a nice splash of color and they look much plumper.